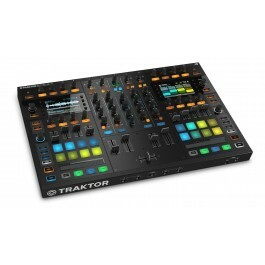 Rent the Traktor Kontrol S8. Please note: Traktor software is not included with this rental. Designed for enhanced DJ performance, TRAKTOR KONTROL S8 is the perfect fusion of hardware and software. The S8’s touch-and-see workflow brings the industry-leading DJ software to life under your fingertips – and right before your eyes. Access transport controls, cue points, trigger loops, and control Remix and Stem Decks directly on the unit. Plug-and-play control of TRAKTOR SCRATCH PRO 2 means no mapping or control assignments necessary. Please note: Traktor software is NOT included with this rental. © 2013 SOUNDHOUSENYC. All Rights Reserved.